Core Consultants | New Year - New Website! We have certainly hit the ground running after the Christmas holiday break and are powering ahead in the new year! We recently celebrated our second anniversary as Core Consultants on Valentines Day, plus we have just held our annual shareholders conference at the end of February, and we are now thrilled to launch our new website. As our business grows, we have recognised the need to develop our online presence even further, keeping abreast with the changing digital space and inline with the delivery of our services. Last year we engaged the services of a local professional marketing business Barking Mad Marketing, a preferred supplier of the Sunshine Coast Council, to undertake a strategic marketing plan for the business and redesign and redevelop our website. We have worked closely together over the last few months developing a website that works for our business and our clients. The website has been designed to provide a lot more information to our clients, easy navigation, and a new modern and clean design. The website is also mobile responsive and integrates our social media platforms. A number of new pages and sections have been added to our new website including showcasing our recent projects, more information about our business, gallery, testimonials, and a fresh news section. An important point to note about our new website, is the domain name has changed. 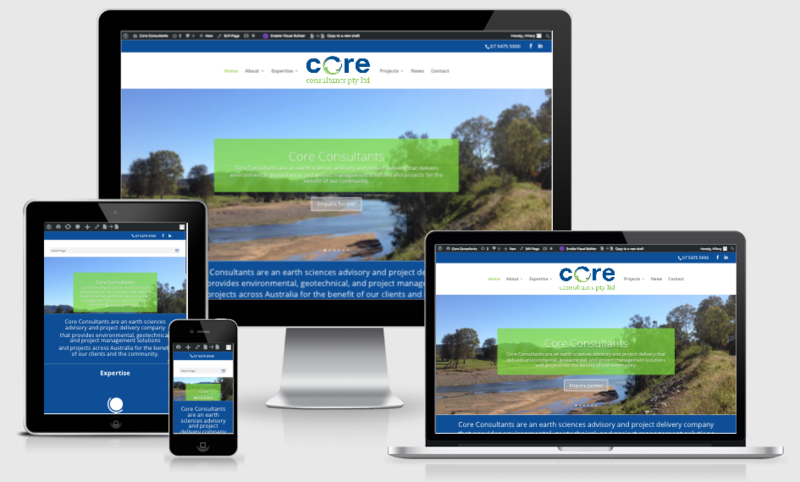 You will now find our new website at our business name, therefore www.coreconsultants.com.au. Our email addresses have also changed and are now name@coreconsultants.com.au. Please feel free to take a tour around our new website and let us know what you think. We hope you like it as much as we do! We anticipate the website will continue to grow with our business into the future – so watch this space!